Aerial Silks classes are taught using weight tested fabric (Tissu/Silk) which is suspended & rigged from the ceiling. Blush Dance run Aerial silks classes for adults and aerial kids club for children & Juniors. Our teachers are all trained with Cirque Du Soleil performers and teachers Elsie and Serenity of Nimble Arts and NECCA. Blush run aerial silks classes for levels beginner – intermediate and private sessions for all levels. We devised our Aerial Silks syllabus with help from our training mentors Elsie and Serenity, it follows a logical syllabus of moves from beginner through to intermediate. Students are taught moves, and routines at a level suitable to their ability. The syllabus ensures that our classes will challenge, encourage safe progression, and motivation to progress at a pace which is right for the student. There is no pressure to work through our syllabus at any pace other than that which is right for you. As students achieve moves at each level they are awarded with a certificate of completion of the level and are invited to progress to working on moves from the next syllabus level. This helps motivation as students can monitor their own progress. 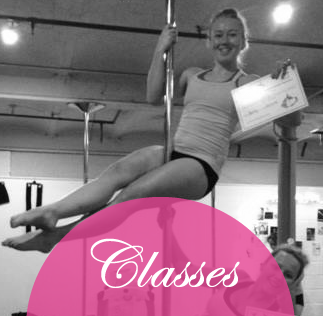 There are 6 levels of our syllabus and our classes indicate which levels of the syllabus you can learn in which class. An introduction of what you can expect to learn at each level is listed below. Level 1, Beginners & Level 2, Amateurs Aerial Silks classes are great for those brand new to aerial silks and those who have some basic knowledge. They include learning basic skills and foundation moves with the silks, include routines using foundation moves and transitions. They are open to all levels, shapes and sizes, no aerial or strength experience is necessary to start training with this equipment. These include our level 1 and 2 Aerial silks syllabus moves. Level 3, Intermediate & Level 4, Advanced Intermediate Aerial Silks classes are ideal for students with confidence in the basic aerial moves and are ready to focus on more challenging tricks and combinations. The classes will use skills and combinations to build towards routines. Classes may also include technique and creative/choreography work. These lessons teach from our level 3 and 4 Aerial Silks Syllabus of moves. Level 5 Advanced, & Level 6 Elite Aerial Silks classes are designed for students who are confident at all levels of aerial silks. Drops, tricks, transitions which require a very high level of strength, skill and knowledge of aerial silks are taught at our level 5 and 6 level aerial silks classes. Get kitted out for class in tight fitting clothes. We recommend a T-shirt/ vest top and leggings. Please bring a long sleeved top when working in aerial silks as it is known to chafe and some moves require the silk to pass under your armpit, so its always best to bone able to be covered. Please do not wear any jewellery at all, and hair must be tied back. This is to prevent anything getting caught in the equipment and causing injury or snagging equipment whilst working to cause damage. We wear bare feet or socks in aerial silks class. As you progress to intermediate levels we recommend a leotard, however not essential at beginner level. We run occasional Aerial Silks tasters, usually around Easter and Christmas time. Please see our facebook page for an up to date list of workshops and taster sessions. 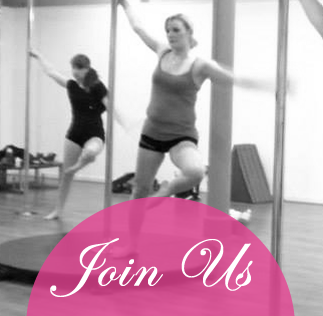 We do run FREE taster sessions every month in Pole Fitness and Aerial Hoop, which are two most popular classes for beginners. 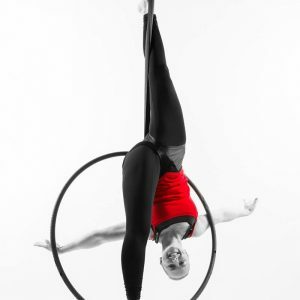 For adults aerial hoop classes students can join from 16 years old. We teach from 6 -11 years in our Aerial Kids Club and Junior classes 11-16 year olds can join us. We also run Kids Aerial Circus parties. 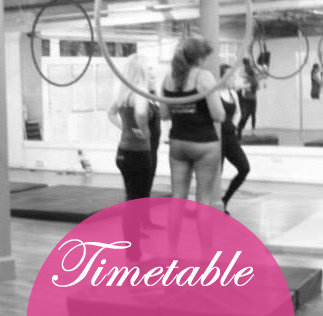 Our aerial classes run in terms of 6 weeks, you can opt to purchase 4 classes out of the 6 week term, pay for all 6, or pay for 12 (two terms or twice per week) the more classes you book in a block, the cheaper per class. For a full price list see our bookings page.